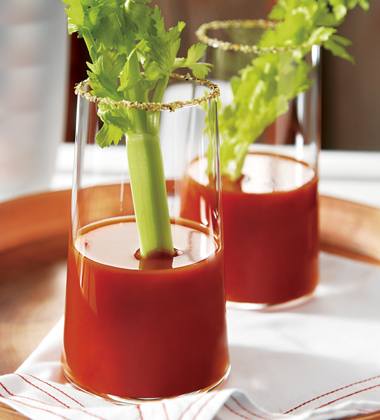 Smoky and spicy, this version of the classic Bloody Mary uses Spicy Hot V8 and can be served virgin or with alcohol. 1 In large glass or plastic container with lid, stir together juice, vodka and hot sauce. Cover and chill at least 3 hours before serving. This mixture can be made and refrigerated up to 3 days before serving. Shake mixture well before serving. 2 For Each Serving: Lightly wet rim of 10-oz. martini glass with lemon juice and dip in rim in seasoned salt, if desired. Place 2 ice cubes in the glass and pour 1 cup martini mixture over top of ice. CCP: Serve beverage chilled to below 40 °F. 3. Garnish with celery sticks and serve. 1. In large glass or plastic container with lid, stir together juice, vodka and hot sauce. Cover and chill at least 3 hours before serving. This mixture can be made and refrigerated up to 3 days before serving. Shake mixture well before serving. 2. For Each Serving: Lightly wet rim of 10-oz. martini glass with lemon juice and dip in rim in seasoned salt, if desired. Place 2 ice cubes in the glass and pour 1 cup martini mixture over top of ice. CCP: Serve beverage chilled to below 40 °F. Garnish Options: Try using other garnish as a substitute for celery sticks including: pimiento stuffed olives; anchovy stuffed olives; Cornichons or other small, sour pickles; pickled okra; etc. Suggested substitutions: V8 100% Vegetable Juice, V8 Low Sodium or Campbell’s Tomato Juice. Flavored vodkas can also be substituted including: lemon, pepper, orange, etc.